This was the first date idea he offered out of the blue — and I must’ve clapped a little bit when I got his invite. It’s pretty clear he knows the path to my heart is strewn with funky vegetables. Off we went for a 6 pm table at Café Maude, a restaurant best known for how hard it is to eat there. Even at that early hour, we sat in a far, not-so-ambient corner near the kitchen, a flash of light uncomfortably lighting up B’s face every time the door swung open. I was looking forward to the charming cocktail list. To B’s dismay, This Charming Man was no longer on the menu, but he asked for it anyway. Nothing was going to come between him and a drink that could make him sing a little Morrissey tune. The bar obliged. I had Ivan Putski, a dirty vodka martini with olives, onion, and black pepper. We ordered our meal in a sort of unplanned give and take, throwing out suggestions and narrowing it down one by one. We shared everything. We didn’t decide we would, we just did. Plate after plate, the server paced our meal, and B and I kept everything in the middle of the table, slowly eating and sharing our opinions of the food. The salad of red and golden roasted beets, mache, frisee, chevre, walnuts, and truffle champagne vinaigrette was perfectly lovely. The house-cut fries were great, but the truffle-mahor “fondue” (a.k.a., room temperature dipping sauce served in a ramekin) was lackluster — and I still don’t know what mahor is. We were pleased but not impressed by the roasted Brussels sprouts with rosemary brown butter, onions, and granny smith apples. Same for the Tuscan rice and parmesan croquettes with asparagus cream, basil, and pancetta. They’re great alongside a cocktail, but not especially memorable, and the asparagus cream didn’t taste like the vegetable it was named for. The last course was glorious enough to carry every other plate of food that crossed our table: PEI mussels (that’s Prince Edward Island for those of us not familiar with island acronyms) with shallots, garlic, white wine, sweet tomatoes, chives, and grilled baguette. It just sang. The only problem is they served it with one lonely slice of thinly cut baguette, which doesn’t make sense, not on any island. He’s right, I thought. Have you ever eaten with friends who get territorial about their meal? Those solitary souls eat by themselves, no matter how many people are at the table. Not only did B and I share this time together, we shared the same experience. B replied, “Of course not.” It’s true. It was all the eating they did together that filled her with such passion. After cheesecake and a chocolate pistachio torte, we drove off to Magers & Quinn for books and Golden Leaf for tobacco to continue the pleasures of the evening, two bon vivants not exactly taking over Paris, but at least enjoying (and sharing) our own little corner of the world. This entry was posted in Minneapolis Restaurant Reviews, Tete a tete (That's French for "dating") on April 29, 2010 by Carrie. The following post originally ran here, the April/May 2010 issue of my column The Sense of Taste with Valley Natural Foods, the lovely organic foods co-op in Burnsville. Go send them your love! It’s a hard-working co-op with a great community feel. In the meantime, if you would like to make the mothers in your life something charming for Mother’s Day, the recipe is for you. My dear Grandma Polly left us on Mother’s Day more than 10 years ago. When I was a young girl, I used to call her Gob-a-gee. I still remember her looking over to me, saying, “Like chicken? Take a wing.” She’d put out her crooked arm, lock it into mine, and we’d hop a bus to go shopping on Mitchell Street in Milwaukee. She gave me apples and peanut butter every day after school, and her breaded pork chops hissed loudly in the frying pan. She also made a mean split pea soup so green and mushy my little brain never understood how anyone could eat it. Over the years, I’ve collected as many things of hers as I can—crocheted afghans, embroidered linens, fine china, and plenty of old pictures. 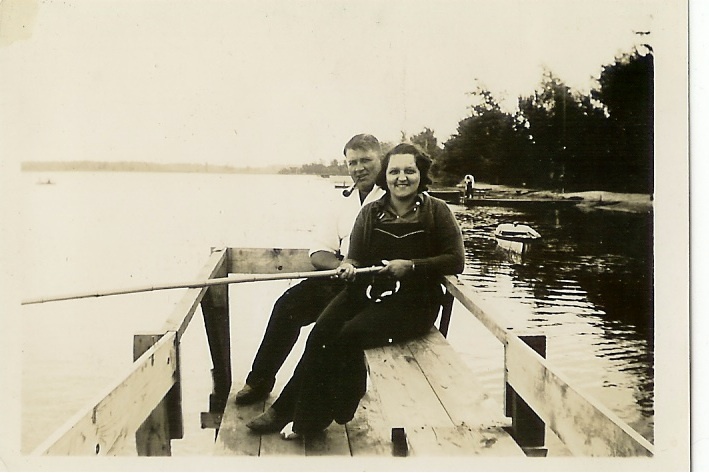 In my favorite one, she and my grandfather, who died before I was born, are sitting together on a wooden pier. She’s wearing overalls and holding an old cane fishing pole, smiling eagerly. He’s rugged and effortless with a pipe casually hanging in his mouth. They are stunning together and, despite time and place, my love for them feels as real as anything I know. This month, I chose to make something as evocative as the memories of a grandmother. 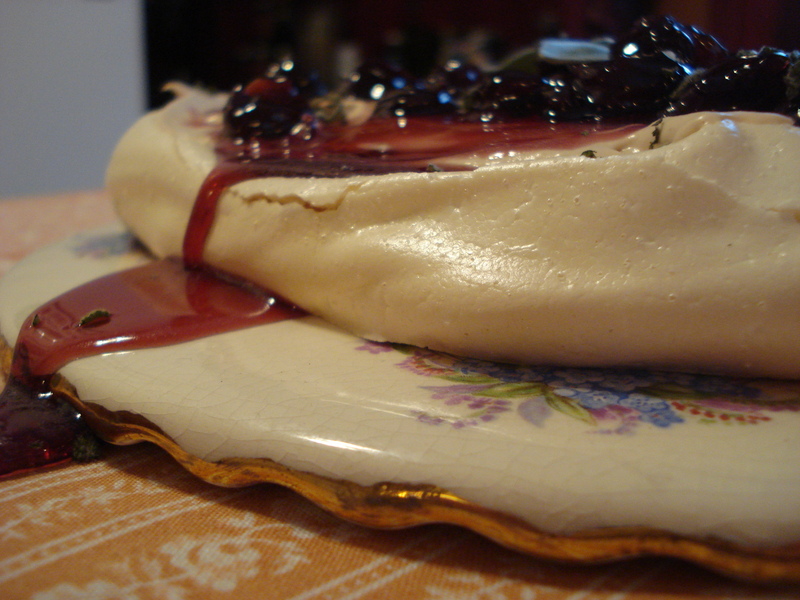 Pavlova, a charming, airy dessert, piques your senses with its ethereal flavors. In Australia and New Zealand, it is so revered every grandmother probably has a version of her own. One bite and you can see why. Pavlova has a mesmerizing effect. The crunchy, yet soft meringue, silky cream, and tart fruit topping all tug at your attention. To further the effect, I added rose water, vanilla, and a hint of sage at the end. Each bite of this recipe dances in your mouth, much like the delicate ballerina Anna Pavlova who inspired its creation in the 1920s. It’s said that a hotel chef was so enchanted by her tutu laced with green roses that he used meringue and kiwi, Pavlova’s traditional fruit, to mirror her beauty on the plate. Another wonderful thing about Pavlova is that it’s easy. This spring, put some flowers on the table and take a lovely afternoon to reminisce with your mother or grandmother while enjoying this heavenly homage. 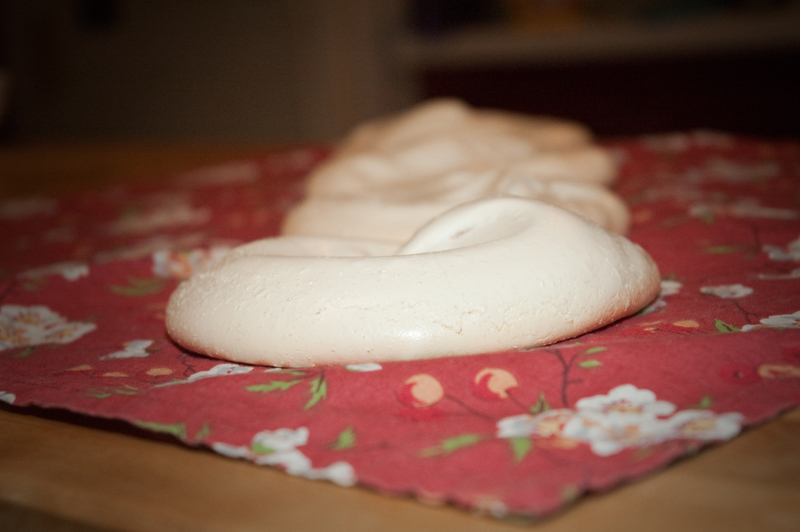 Your meringue will probably crack in the oven, which is normal and only adds to the patina. You can buy rose water at Holy Land or in the wellness department of most co-ops. You can also use cherry jam or sliced fresh or frozen cherries. Preheat oven to 250°F. 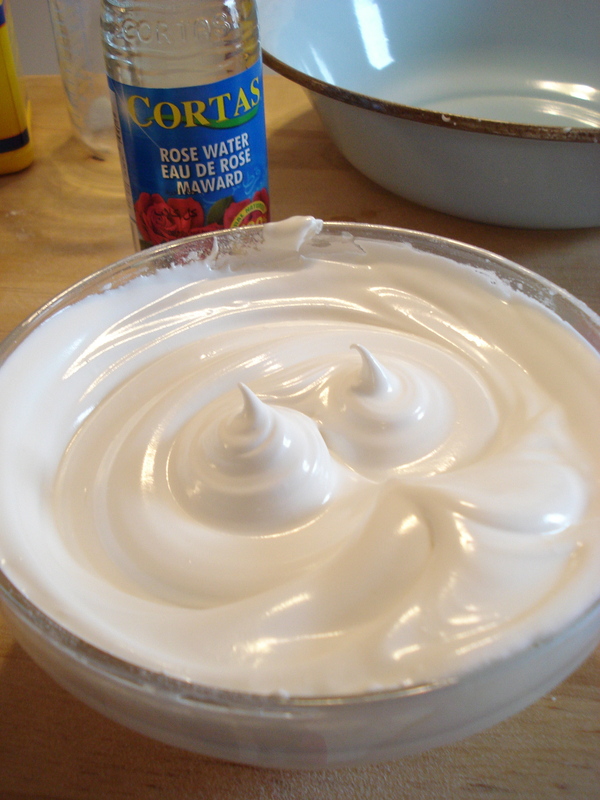 Place egg whites in a bowl and whisk with a handmixer until billowy, about 3 minutes on high speed. While whisking, slowly add the sugar and then the cornstarch to the egg whites until the mixture becomes glossy, about 3 to 4 minutes. Add the vinegar and rosewater and whisk again to combine. With a spatula, shape the mixture into eight 4-inch rounds on two baking trays lined with parchment paper or tin foil. 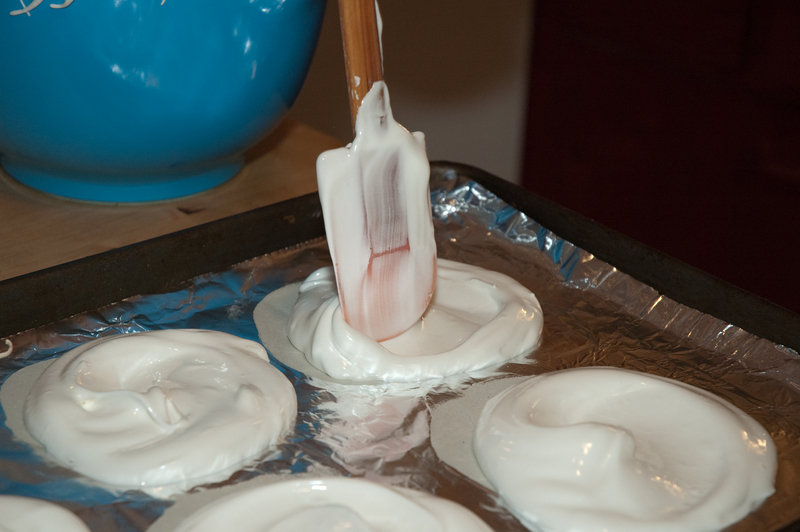 Holding the spatula perpendicular to the meringue, turn it in a circle to create a slight indentation in the center so the fruit and cream have a place to rest. Bake until the crust is pale and golden, about 40 minutes. Turn the oven off and let cool inside for 1 hour or overnight. When ready to eat, whisk the cream in a bowl until stiff. Add vanilla and sugar and whisk until peaks form. Line the pavlova on small dessert plates. 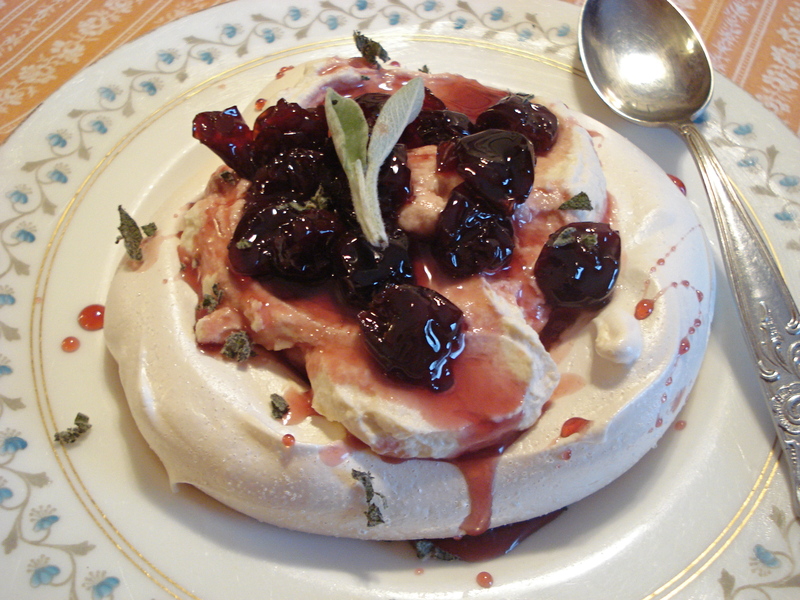 Spoon on a generous amount of cream and then sour cherries and sprinkle lightly with sage. Serve with a linen napkin, small spoon, and herbal tea. 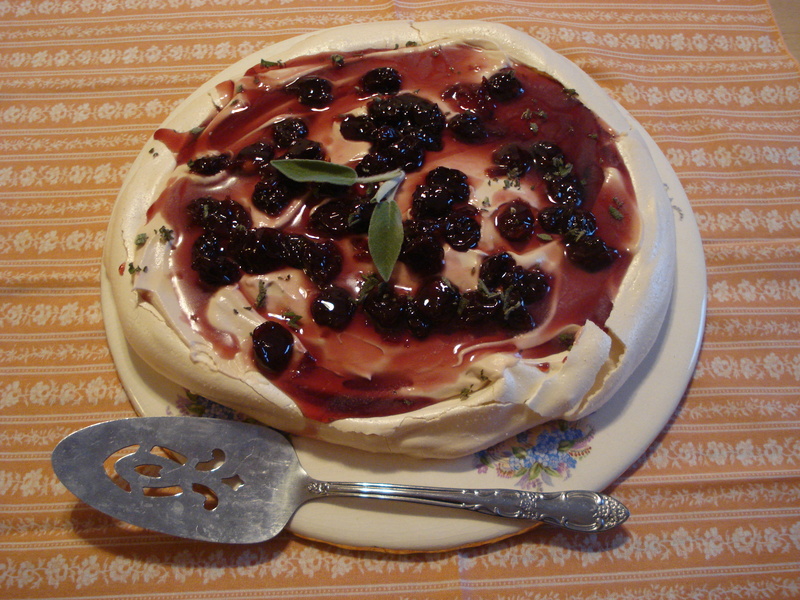 You can also take the more traditional route and make one large pavlova. I just think there’s something special about having an individual cloud of meringue served especially for you. Just be careful, in any case, as those gorgeous sour cherries might ooze all over your plate. This entry was posted in Things I Make on April 2, 2010 by Carrie.